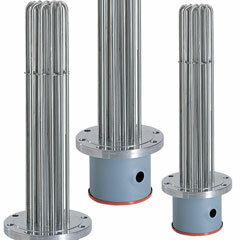 Watlow flanged immersion heaters are easy to install and maintain. Designed for heating liquids and gases in tanks and pressure vessels, flanged immersion heaters are ideal for applications requiring higher kilowatts. Watlow flanged immersion heaters are made with WATROD or FIREBAR tubular elements brazed or welded to a flange. Stock flange heaters are equipped with a general purpose terminal enclosure. Flanged immersion heaters, with FIREBAR elements, also answer the need for liquid immersion applications requiring high kilowatts in small tanks. The FIREBAR element's unique flat surface geometry packs more power in a smaller bundle, with lower watt density, making it especially well-suited for petroleum-based liquid heating applications.